Description: This is a very rare bank note. Queen Mary is pictured on the front of each 1911 $500 bill from Canada. These were all printed by The American Bank Note Company. For some reason the simple portrait, red serial numbers, and yellow-brown tint really create a beautiful bank note. 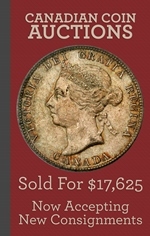 Varieties: Thank goodness, there are no varieties for the 1911 $500 from The Dominion of Canada. Finding any example is difficult enough as it is. 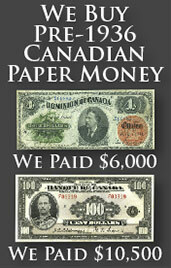 We buy all 1911 $500 bank notes from The Dominion of Canada. Values are based purely on condition and generally start at about $75,000. If you would like our offer, then please send us pictures of your bank note. We will grade the paper money and respond back quickly with our buy and sell price. You might be surprised at how much money some high grade notes can be worth.